Human is a 2015 documentary by French environmentalist Yann Arthus-Bertrand. The film is almost entirely composed of exclusive aerial footage and first-person stories told into the camera. It was the first film to premiere in the General Assembly Hall of the United Nations, to an audience of 1,000 viewers, including the UN Secretary General Ban Ki-moon. The film was financed by the Bettencourt Schueller Foundation, which gave it rights-free to the GoodPlanet Foundation, responsible for driving the project. An extended version of the film is officially freely available on YouTube (in three parts). Human was produced over a period of three years, with director Yann Arthus-Bertrand and a team of 20 persons interviewing more than 2000 people in 60 countries. The crew included five journalists and cameramen with a "fixer" in each location for organizing things and four people responsible for receiving and sorting the material. The aerial crew had 6 people including Arthus-Bertrand. According to the film’s website, its distribution is designed to be made under "the freest conditions to the widest possible audience." On 12 September 2015, the film was screened simultaneously at the United Nations, at the Biennale del cinema in Venice and on YouTube. It was also premiered in over 400 screens in France on the same day. Google, the exclusive digital partner of the film, made the film accessible worldwide on YouTube in six languages: English, Russian, Spanish, Portuguese, Arabic and French. The film was released in 11 different variations, including a theatrical version, a web version in three parts, a music version, TV episodic cuts and behind-the-scenes footage available on YouTube. At the 2016 Vancouver International Film Festival, Human won the award for Most Popular International Documentary (based on audience balloting). The film was generally well received by critics who praised its unprecedented scale and coverage of topics such as family, religion, ambition, failure, homosexuality, war and poverty. The film was also praised for the truth and brutal honesty behind the people's stories as well as Arthus-Bertrand's artistry in contrasting the subjects with aerial shots that are infused with motion, color and people. However, film critic Guy Lodge criticized the movie for its arduous three-hour length, saying that "... these stories retain little individual power or resonance, while the pic’s sporadic interludes of lush landscape lensing risk aestheticizing the personal struggles in question". ^ a b c d Locke, Charley (16 September 2015). "The Documentary That Found Humanity by Interviewing 2,000 People". Wired.com. Archived from the original on 3 January 2016. Retrieved 5 January 2016. ^ a b c "HUMAN - Press book" (PDF). human-themovie.org. Retrieved 5 January 2016. ^ See "Archived copy". Archived from the original on 2014-03-10. Retrieved 2016-05-28. CS1 maint: Archived copy as title (link) and "Archived copy". Archived from the original on 2016-05-02. Retrieved 2016-05-28. CS1 maint: Archived copy as title (link) (pages visited on 28 May 2016). ^ Taylor, Alan (24 September 2015). "What It Means to Be Human, by Yann Arthus-Bertrand". The Atlantic. Archived from the original on 4 January 2016. Retrieved 5 January 2016. ^ a b c d Rothe, E. Nina (9 December 2015). "Yann Arthus-Bertrand's Human: "Love Is the Answer"". The Huffington Post. Archived from the original on 22 March 2016. Retrieved 5 January 2016. ^ Quito, Anne (14 September 2015). "Humans of the world: This stunning new film will change how you see yourself". Quartz. Archived from the original on 5 January 2016. Retrieved 5 January 2016. ^ Lawless, Jill (10 September 2015). "UN-endorsed documentary 'Human' premieres at Venice film fest". The Associated Press. Archived from the original on 18 December 2015. Retrieved 5 January 2016. ^ Anderson, Ariston (3 September 2015). 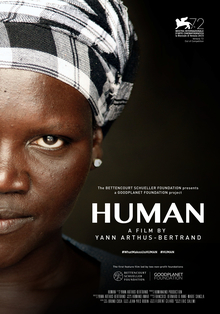 "Yann Arthus-Bertrand's 'Human' to Get United Nations Screening". The Hollywood Reporter. Archived from the original on 6 January 2016. Retrieved 5 January 2016. ^ "Maudie Wins Coveted VIFF Super Channel People's Choice Award" (Press release). Greater Vancouver International Film Festival Society. 14 October 2016. Archived from the original on 18 October 2016. Retrieved 18 October 2016. ^ Lowney, Tricia (24 September 2015). "Human: Extended version VOL. 1 (2015) Review". The Film Magazine. Archived from the original on 2 March 2016. Retrieved 5 January 2016. ^ Lodge, Guy (17 September 2015). "Film Review: 'Human'". Variety.com. Archived from the original on 4 January 2016. Retrieved 5 January 2016. This page was last edited on 22 September 2018, at 06:35 (UTC).